SeeekLab completed “the longgest seesaw” project on July 2015. This special project is created to help a father to play seesaw with his son who lived 1180km away from him. More than 40 domestic and international mainstream media have reported on this, it has once become a phenomenal event at the time. Haibin is a member of SeeekLab who work and live in Xiamen, away from his wife and newborn children in Tengzhou. For him, video calls are not helpful when he misses his family. 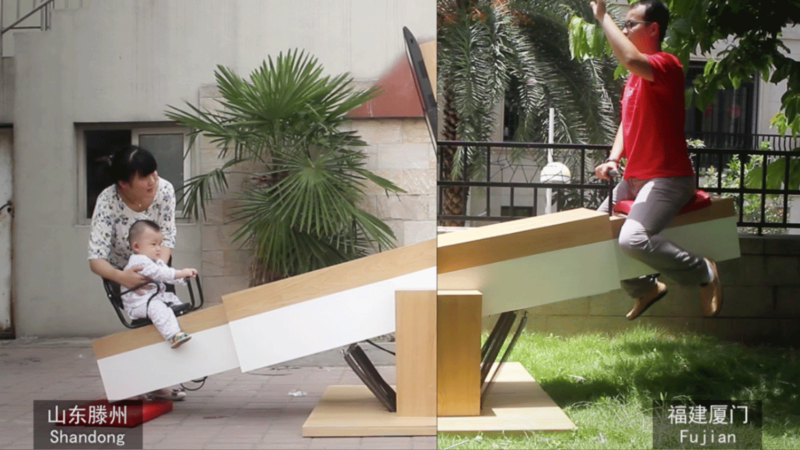 To help the father to regain the joy of being together with family, SeeekLab designed a pair of remote seesaw . When Haibin pressed down one end of the seesaw in Xiamen, the son on the other side (which is 1180 km away from him) will tilt , just like they were playing the real seesaw.